It will come as no surprise to regular readers that I am firmly on the side of Brexit. 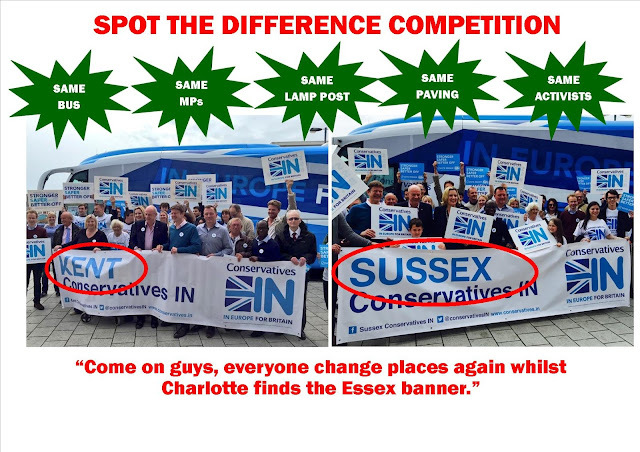 However, I am also professional and completely endorse the Conservative Party's official neutrality on this issue. 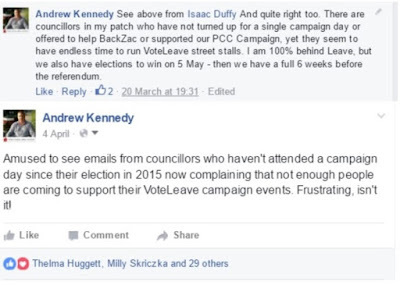 Despite my wholehearted support for Vote Leave I have steadfastly refused to do any work for the Leave campaign in the run-up to the local, PCC and London Mayoral elections on Thursday 5 May, and have openly criticised local Conservative activists who have campaigned for (or against) EU membership when we had vitally important elections to win on our doorstep. What intrigued me about this organisation is that I had never heard of them nor knowingly given them my email address, particularly as the one used was my private email, not in the public domain. A quick round-robin to friends and colleagues in the South East indicated that most had also received the newsletter despite never knowingly providing their data or requesting to be put on the organisation's mailing list. A bit of further digging then highlighted that the registered address for the Group's website was listed on whois.com as being the same address as a Buckinghamshire Conservative Association, as indeed was their registration details with the Information Commissioner's Office. 1. How did they obtain my email address and that of so many others, who have never knowingly signed-up to receive such information? 2. Have they permission from CCHQ to use the Conservative Party name and title to disseminate pro-Remain information in this way? 3. 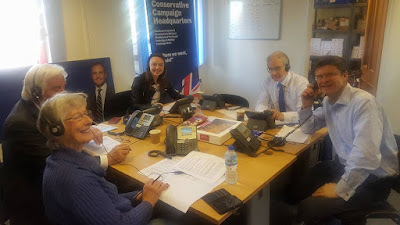 Is it right that a Conservative Association office should be used to accommodate this group and facilitate its activities, when the Party and all of its branches and employees are officially neutral in this campaign? 4. Given the need for fairness and balance, will SECEN provide Vote Leave with their database so that those who received SECENs newsletter may also receive a balancing view in this important debate about our country's future? The Conservative Party was absolutely right to take a neutral stance on this issue, allowing members, staff and elected representatives the opportunity to campaign in accordance with their beliefs. Such impartiality will be vital in restoring not only unity post 23 June, but also in rebuilding the long-term bonds of mutual trust and respect upon which our future success will be built. This approach will only succeed if all those involved accept both the letter and the spirit of that understanding. Many readers will know that I am on enforced bed rest at home, convalescing from a routine hernia operation last Saturday. Bored witless, unable to walk any distance and barred from driving, I am catching-up on a backlog of reading and haranguing my friends on social media in search of sympathy. I am not sure if my photograph led her to assume that I was due a hip or knee operation, or whether the average Conservative activist is so surrounded by fellow geriatrics, that it was a natural assumption! Then my good friend Matthew Plummer Matthew Plummer, on reading that I was considering watching a YouTube re-run of the 1987 GE Campaign kindly emailed me a link which he thought I might find of interest. It was a recording of the 1996 Municipal Election results for Wellington Central in New Zealand. Apparently if I watched carefully I would be able to see a flash of his shoes. I have suddenly and unpleasantly glimpsed my retirement - stuck in bed with painkillers and a bad hip and watching re-runs of Kiwi election results programmes from 1996, eagerly anticipating a glimpse of Matthew Plummer's shoes. Some readers will know that my partner is a Funeral Officiant. This morning I was listening to him dictate a "eulogy" and heard a reference to Margaret Thatcher. After he finished, I asked him about it, as it seemed a strange thing to have in a funeral service. He told me that Mrs Thatcher is mentioned in around one in ten eulogies, 50% in a positive way and 50% negatively. I asked him for more details. Apparently people say "we bought out first home after Mrs Thatcher allowed people to buy their council house, and we never looked back." Or, "He was so proud after Maggie broke the power of the unions and put the country back on its feet." Or, "He was a Conservative all his life but never forgave them after they knifed Maggie in the back." There are unfavorable mentions, too. "He lost his job after Maggie sold off the (insert nationalised industry here) and he never got over it. And, "he never forgave Maggie Thatcher for what she did to the shipyards." I found this fascinating and truly remarkable, though I shouldn't. I am one of Maggie's Children; she gave a poor lad from a single parent family growing-up in a council estate in Merseyside the hope, ambition and confidence to move on. Her vision for Britain not only informed my politics but shaped my life. Her portrait is the only one in my office. I still look back to the 1980s when she and President Reagan dominated the world stage as our true halcyon days. And I still have not forgiven those pygmies who brought her down, though even I will admit that her time was probably up. And twenty six years (a quarter of a century) after she left office, one in ten people still want her mentioned at their funeral. With the exception of Winston Churchill, I can think of no leader before nor since who commanded the country as she did. Steve said the only other Prime Minister ever mentioned at funerals is Tony Blair, and that sadly is usually along the lines, "she never got over the death of her grandson in Iraq". 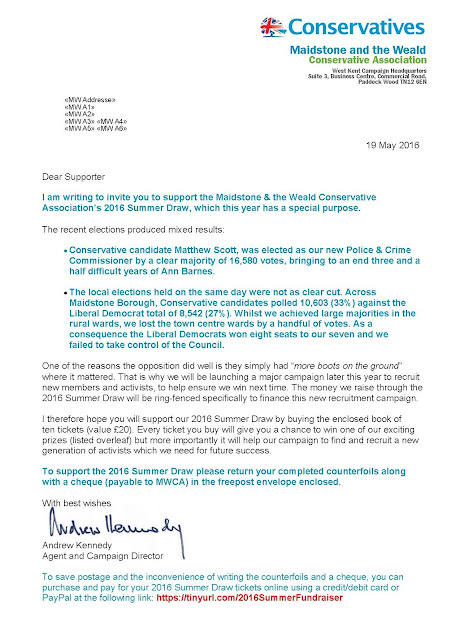 For those who follow and take an interest in what we do, I am pleased to attach copies of our 2016 Summer Raffle Appeal Letter. Admittedly the prizes we can offer are no match for the national draw, but our research indicated that people don't buy tickets for the prizes, but to support the Party. 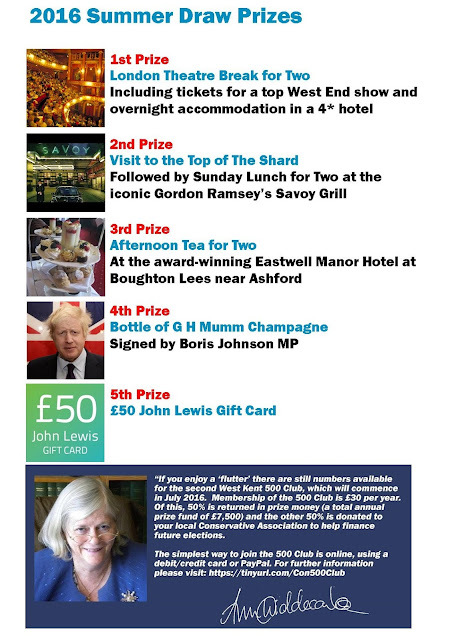 Also, due to the quantity of the tickets we sell in West Kent (around £10,000) it is better value for us to pay for our own tickets to be printed and for the prizes (though we often have these donated) than paying 25% to NCDS. Clearly this option is not available or cost effective for the majority of Associations with a smaller pool of ticket buyers, but it works for us. I am delighted that Jacob Rees-Mogg MP has agreed to appear at the fifth of our popular series called "An Audience with...."
Jacob will be coming to Kent on Friday 8 July 2016 and will be interviewed on stage at the Lenham Community Centre, Groom Way, Lenham, Kent ME17 2QT by Helen Whately MP commencing at 6pm. The interview will last approximately 30 minutes and will be followed by a further 30 minutes of questions from the audience. After the interview, Jacob Rees-Mogg MP and Helen Whately MP will attend an "after show" Champagne and Canape Reception at the same venue. Tickets for the show are just £10.00 per person. Tickets for both the show or the show and Champagne reception may be purchased online using debit/credit card or PayPal, using the link below. Please contact the Association Office on 01732 842794 if you have any questions. Until we widen and deepen the pool of talent in which we fish for our Local Government Candidates, we will continue to put forward too many who are pale, male and stale. One of the problems is that there are too many councillors sitting on too many councils – but that is an article for the future, as are my suggestions about how we can attract new talent. For now political parties must play the cards we have been dealt. Depending on your electoral cycle, this can result in having to find up to 50 local candidates who are committed, community-minded and good communicators from a limited talent pool. The overwhelming majority of councillors I know work hard for very little financial reward, and often for no thanks from their electorate. However, too often local parties take the easy option by simply reselecting the incumbent regardless of his or her abilities and performance. This is often easier than facing the difficult and unpleasant decision to deselect and to recruit and train new people from the wider community. In following this path of least resistance Associations are doing a disservice to themselves, local residents and ultimately the quality of Local Government. At the recent Spring Forum it was announced that the Mandatory Selection Rules are going to be reviewed. Admittedly the present rules are cumbersome, but they are generally sound and, if followed, equip Associations and Branches with all the tools they require to select the best possible candidates. Each year my performance is appraised by my line-manager. If I consistently under-perform, and make no effort to improve, I would fully expect to face a disciplinary process, and eventually dismissal. 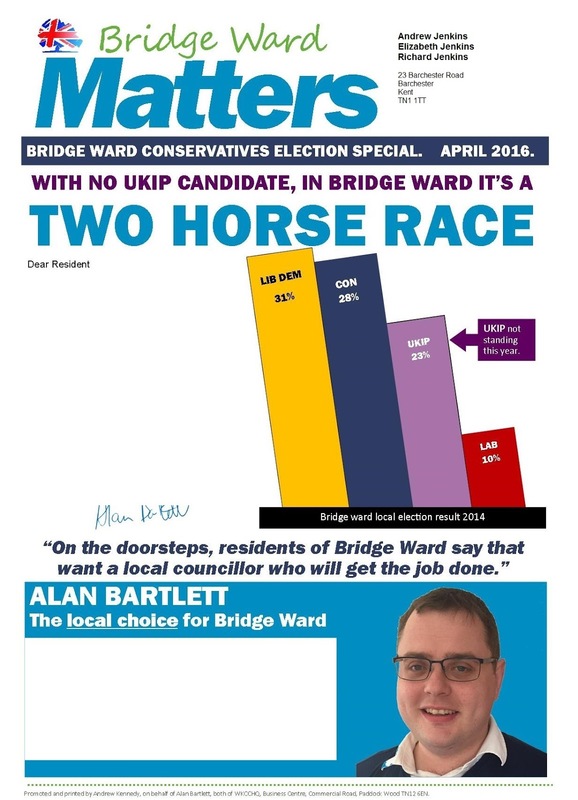 Yet across the country there are too many councillors of all parties who have “gone native”, or who simply refuse to support the campaigning objectives of their local Association. Some even seem to declare UDI, and believe they are bigger than the Party with whose brand and reputation they were elected. Whenever I brief new candidates I make the point that they should always be “champions of the people”, elected to represent their communities in the Council Chamber. Too often they become defenders of the bureaucracy, simply rubber-stamping decisions made by Council Officers. In the “Candidate’s Agreement”, now used nationwide, there is a list of requirements for new and existing applicants, including the obligation to “co-operate fully with the Party’s campaign strategy for elections, including giving mutual aid to other Conservative candidates when asked and, when themselves a candidate, comply with the requirements of the election agent.” New and incumbent candidates sign this before they are re-interviewed and should therefore not b surprised when they are called on to fulfil these promises. In one of our local Associations six non-performing councillors (around 12% of the total) were deselected (although four of them fell on their swords rather than face opprobrium.) I have found that you only need one or two deselections for the other councillors to regain their focus! In ensuring the best people represent the Conservative Party locally we need to ensure that those who select our candidates have the skills and abilities to do so. This means that each Association’s “Local Government Committee” (or Approvals Committee) is comprised of people with the confidence, vision and courage to do what is right – and, where necessary, their tool-box should include the willingness to remove from the Approved List habitual poor-performers, self-servers and non-starters. Too often I am told that local branches simply reselect the incumbent because it’s easier and kinder to do so – that is precisely why the Local Government Committee should make those difficult decisions for them. If a non-performing councillor is removed from the “Approved List”, then the local branches are spared the task of telling “Good old Harry” that it’s time to call it a day. 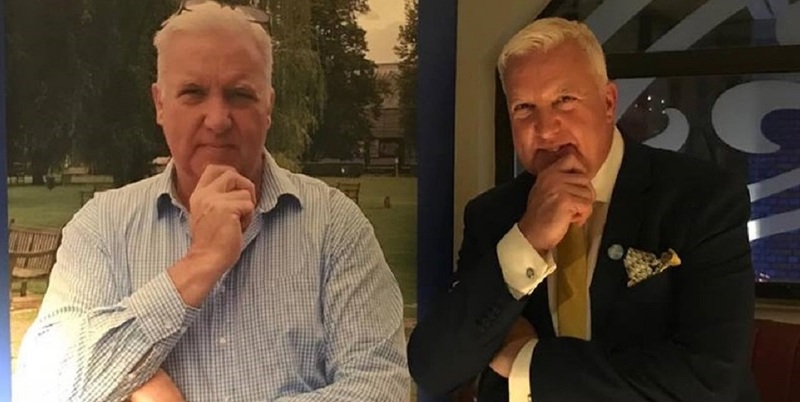 Sometimes the very decision is an act of kindness; “Good old Harry” is often doing “one more term” because he thinks there is no-one else, whereas in reality no-one else will come forward until “Good old Harry” retires. However .... “Good old Harry” does not always go with grace. One of the questions I am most often asked is about Local Government Candidate Selections. This normally comes via a plaintive call from an Association Chairman who is facing the wrath of a deselected councillor. My advice in such circumstances is always clear. “If you have followed the rules, there is nothing to worry about”. Appeals against deselections can only be accepted if due-process has not been followed. The fact that a disgruntled councillor, or his supporters, don’t like the outcome is irrelevant. It is right that where there is an active branch which meets the CCHQ “Qualifying Threshold” for Branches to run the interview process, that they are allowed to do so. The rules specify that to qualify for self-selection from the Approved List, a branch must have either 20 qualifying members or a membership equal to 2% of that ward’s Conservative vote, whichever is the greater. This is designed to ensure that a cabal of councillors and their friends cannot dominate the process for perpetual self-interest. The weakness, however, is that the Mandatory Selection Rules do not define “an active branch”. There are too many branches which never campaign, raise money, or contribute to the Association’s success, but miraculously spring into life when the reselection process starts. In two of West Kent’s Associations we defined an “active branch” as one which (i) holds a legally constituted AGM, (ii) raises money over and above membership income, and (iii) meets regularly throughout the year. There are, however, some who confuse attending endless (and often pointless) Council committee meetings with community campaigning. And yes, there are also a small number who are simply bone idle. In a recent West Kent by-election, in a critical marginal seat, nearly half of that Borough’s Conservative Councillors did not turn out to help – while over 70% of the neighbouring Borough’s councillors did so. This is what we must address. Earlier in this article I referred to the “Candidate’s Agreement” which is signed by both new applicants and incumbent councillors seeking re-approval. The second clause of the “Agreement to Stand” states, “Councillors and, where appropriate candidates, must play a full, active, and constructive part in their local Association and Branch during the whole of their period of office, including campaigning, membership development, fund-raising, social and political activities.” It is not unreasonable for Associations to insist that those who sign such an agreement uphold their promises – and to take action against those who don’t. 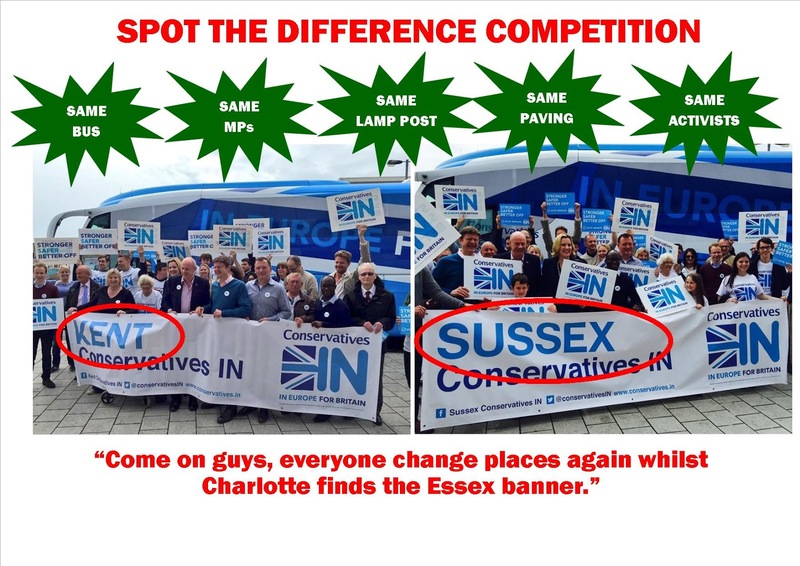 A short video of our wonderful West Kent GOTV Team in action. 12.30pm - Now at capacity and making 400 - 500 calls per hour. 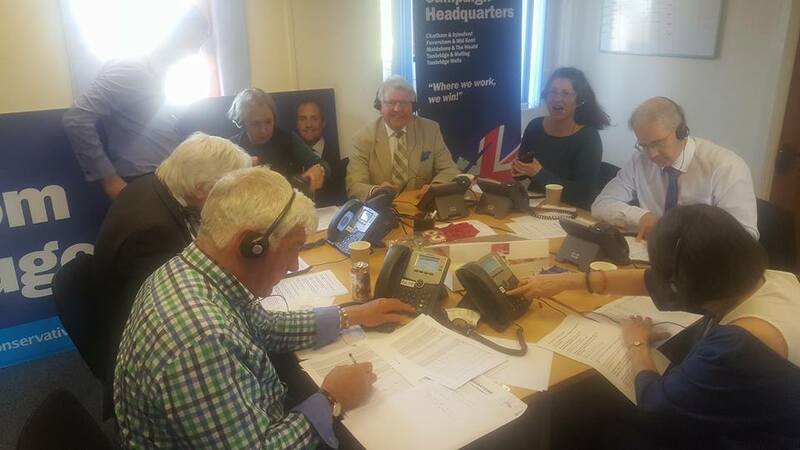 10.15am - Greg Clark MP for Tunbridge Wells and Secretary of State for Communities and Local Government, reports for duty at the West Kent Phone Bank. 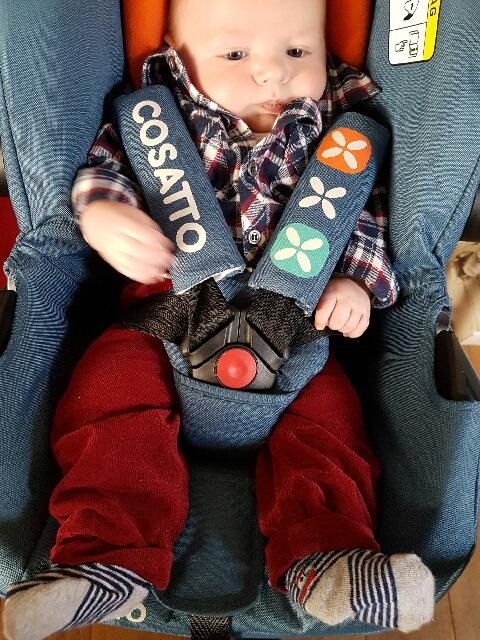 10am - Just received a lovely good luck message from Tracey Crouch MP... "Just to let you know Freddie is wearing red trousers today to show solidarity with the West Kent Agent." 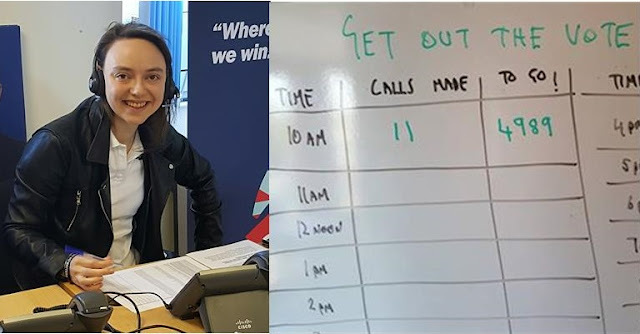 9.30am - early bird Cllr Sophie Shrubsole turns up to make the first calls to supporters. Our target today is 5,000 calls. 11 down, 4,989 to go. 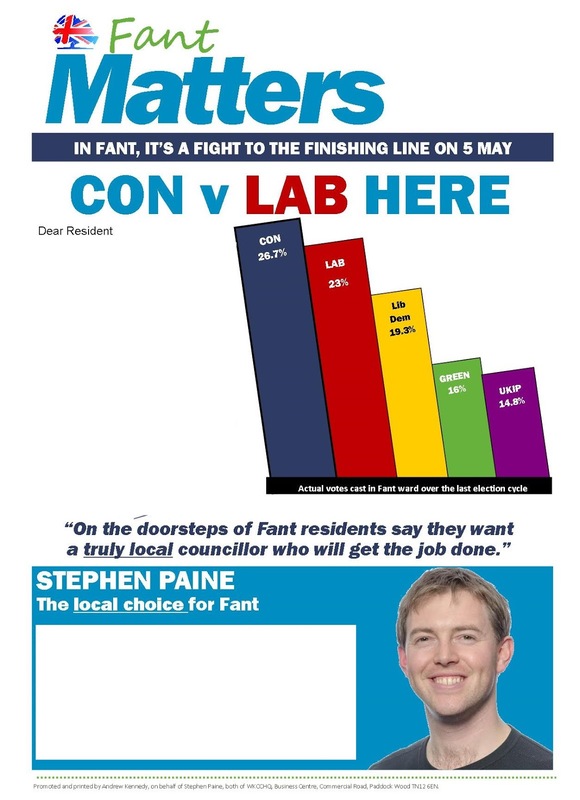 7am - The ever ebullient Cllr Matt Boughton delivering the Dawn Raid in Fant. Not sure if he's smiling or grimacing. Across West Kent candidates in our target wards have just completed delivery of their target voter leaflets. We have done targeted deliveries for many years now, but this year we have tried something new. 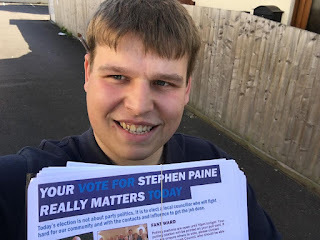 By linking our pledge database with what people have told us via Residents' Surveys and on the phones and doorsteps, we have produced personalised leaflets for each voter, dealing specifically with the issues that elector or family have told us are important to them. In total there were over 900 versions of the letter, produced by using "variable paragraph" mail merging.